This week at one of my customers I got an error during the VM console connect that was initiated over the VMM console. Virtual Machine Manager lost the connection to the virtual machine for one of the following reasons. If you use your favorite search engine, the search engine will point you directly to the following KB article by Microsoft. I double checked the access permissions and could not find a mismatch there. So what is the cause of this error? As an IT administrator you have two user accounts. One for your daily work and one for the administrative work. In this situation your administrator user account is a member of the administrator role in VMM and you are logged in with your normal user account on your workstation. 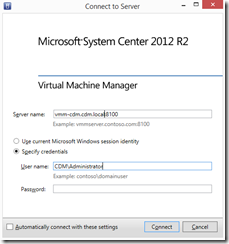 If you start the VMM console you will type in your administrator user account credentials. Everything is correct. But your VMM console process is not running in the administrator user account context because you have started the VMM console within your normal user account context. That is the reason why the VM console connect fails! 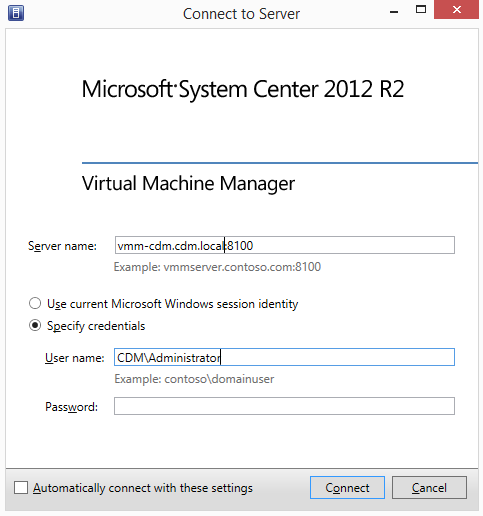 You must start the VMM console with the option “run as different user” using your administrator user account credentials. Then the VMM console connect succeeds. 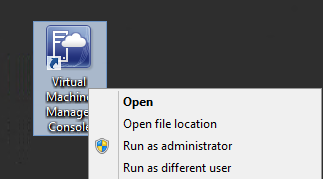 As you have seen it is a permission issue because your normal user account does not have the permission on the VMM. This entry was posted in Hyper-V / SCVMM, System Center and tagged Hyper-V, SCVMM, System Center, Virtualization on 22. January 2015 by Daniel.